Propagating Garden Plants by layering. Layering is a simple method of propagating shrubs without a green house or cold frame. It is based on the fact that a plant that has been cut, scraped or fractured is likely to produce roots from the wound if this portion of the shrub is in contact with the soil. The best branches for layering are non-flowering ones that have grown in the current year. That is, the freshest, smoothest shoots. Deciduous plants are best layered in autumn or winter, evergeens in autumn or spring. 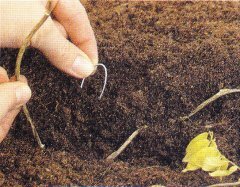 First, fork over the surface of the soil around the plant. Choose any flexible branch and bend it down until it reaches the ground thirty centimetres from the tip. Strip the leaves off the branch where it touches the soil. Wound the underside by cutting the stem just behind a leaf or a node towards the tip end. Bend the cut open and ensure the cut stays open by slipping a small piece of matchstick or toothpick into the gap. Then bend the stem down and bury the cut section, allowing the leafy tip to protrude at the end. 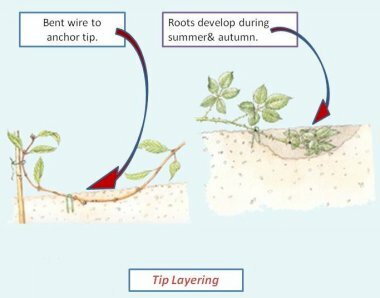 Because the stem ‘snakes’ in and out of the soil, this method of propagation is often called ‘serpentine’ layering. If the stem is long enough it can be helpful to stake the tip end so that the new plant will start with a good straight leading shoot. Leave the plant undisturbed, but keep moist, until the tip shows definite new growth. Then check for root development. Be patient � this can take more than a year. After the roots are well developed, the new plant can be cut away from the parent. When branches are too stiff or too high to be layered at soil level, they may be layered in the air. This can be done between May and July. Select a stretch of branch of the current year's growth and strip off the leaves in the middle. Then cut off a shallow slice of wood and put rooting compound on the wound. Wrap a piece of polythene around the area of the cut and tie the bottom of it with raffia or string. Fill the open topped tube with a mixture of equal parts moist peat, coarse sand and sphagnum moss. Fasten the top. About ten weeks later, remove the polythene and cut off the new plant below the roots. Pot into pot containing potting compound. Place the potted shrub in a cold frame for two weeks and keep it moist. Then harden it off. This entails opening the frame during the day, gradually admitting more air until until the cold frame is left open entirely. Plant out the following spring. Remove all the leaves from the section of runner to be buried or they will rot in the soil. This will delay, if not prevent, the formation or roots and new plants. 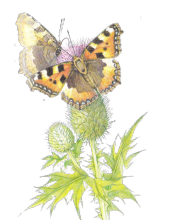 Asexuual, or vegetative, methods of propagation produce exact replicas of the parent plant, unlike sowing, which is the sexual method of propagation. 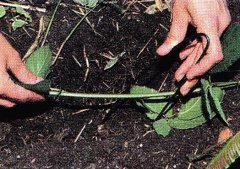 Cuttings: Planting a piece of young stem, or other part, taken from the mother plant so that it will take root. Nothing could be easier, but the procedure is not suitable for all species. Suckers: Using a small tree or shrub that is attached to the underground stem of the mother plant ready to develop. Division: Removing and replanting part of a clump, consisting at least of a bud and roots.